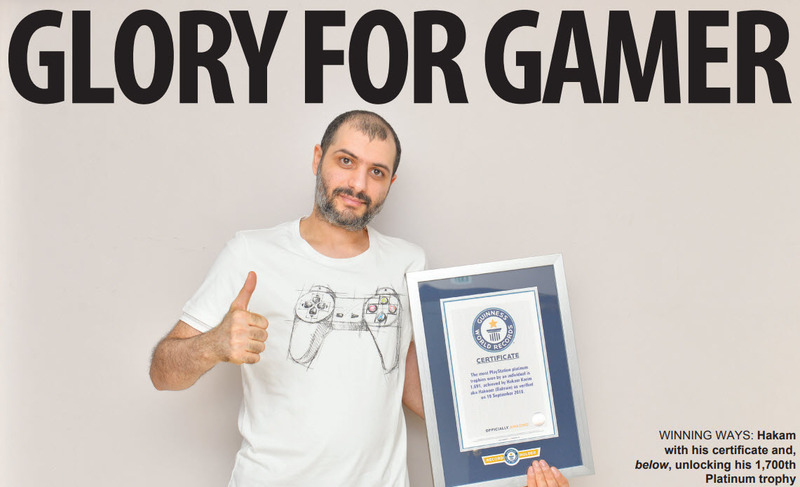 Avid Bahraini PlayStation gamer Hakam Karim has established himself as the king of gaming by becoming the proud holder of a Guinness World Record for his online exploits, and is being earmarked to lead the next generation of elite players. The 34-year-old former Bayan School pupil and Arab Open University graduate first got hooked on collecting ‘trophies’ – in-game achievements unlocked by completing certain tasks within games – back in 2008 when Sony first released them for the PS3 system. Now, a decade later and under his handle ‘Hakoom’, he has earned 70,737 trophies and 1,736 Platinum prizes at the time of writing, and it is the latter for which he has been recognised. A Platinum is the final trophy that is unlocked once all the other trophies (Bronze, Silver and Gold) in the game have been earned and a reward which signifies that the game has been fully completed. When Guinness officially acknowledged him on September 19, he had 1,691 Platinum Trophies, a haul more than a hundred greater than his nearest competitor. Hakam, who lives in Adliya, said: “As soon as I popped my first trophy when playing Super Stardust HD, I became addicted. I had quite a lot of free time when trophies were released and it was a new way to play games, so I tried to unlock as many as I could. Despite finishing his studies and obtaining a Bachelor’s Degree in Information Technology, Hakam decided to forgo launching into a full-time career and instead focused on trophy hunting. Now, he has finally achieved the recognition he has long desired, after many years of being rebuffed by Guinness. Hakam attributes this to the current explosion of video gaming into mainstream culture, with the rise of e-sports and celebrities involved in online games such as Fortnite. In fact, Guinness are collating a new video game-centric record book to be released in the near future. Hakam worked at Bloomberg for two years before its office also closed. He is married to Jana, a German national, who he met online through a mutual love of gaming. They have a three-year-old son, Karim. Since Bloomberg closed, Hakam has been feeding his habit with a combination of a family and marriage allowance, renting out his vast collection of games, and occasionally through his ‘Trophy Service’ – where other gamers pay to have Hakoom’s friends earn a Platinum trophy for them and he takes a commission. However, he may be on the verge of returning to work. After his stunning Guinness success, Hakam was invited to a meeting with the Secretary General of the Bahrain Olympic Committee, Abdulrahman Sadiq Askar, who has held initial consultancy talks with Hakam regarding the emerging e-sports scene in Bahrain. As featured in GulfWeekly earlier this year, Saudi pro-gamer Musaed AlDossary triumphed over more than 20 million other players to be crowned the champion of the FIFA 2018 eWorld Cup Final, and Bahrain wants to match its neighbours by establishing a legitimate operation for its budding gamers. Some gamers in the kingdom, many of whom are Hakam’s friends, win regional tournaments on games like FIFA and Tekken, and have been hoping for many years to be taken seriously by the BOC. Now, opportunity and sponsorship is imminent. However, Hakam believes that his lack of ‘traditional’ employment has aided him in his quest for glory. Hakam dismisses criticisms, merely attributing the abuse primarily to jealousy from those who wish they could just play video games all day, but have to balance gaming time with schooling and work commitments. The most frequent barbs are those tired clichés aimed at gamers, such as ‘you have no life’ or ‘you’ll never have a girlfriend’, both of which Hakam can heartily dismiss by pointing at his robust social life, large friendship circle and his aforementioned marriage. After waking up, he makes sure to spend a number of hours with Karim, either by taking him out or playing with toys, before settling down in the evening to tackle his latest games. Despite being at the top for a decade and seeing off numerous challengers, Hakam has no intentions of slowing down. He is the first to admit he is addicted, and on a number of occasions admits to have felt ‘broken’ and ready to give up. However, the Guinness honour, something Hakam labelled as ‘the one per cent chance I was clinging on to’ has given him a new lease of life. He said: “Since I got this award and since the Bahraini officials approached me, it’s like a fire has been lit inside me. I’m more motivated than ever. I’ve also gained a large number of new followers on social media, and prominent game companies have offered me congratulations and agreed to send me special editions of their games for free.